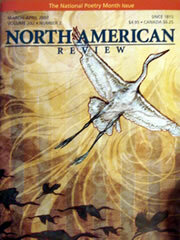 The March/April issue of North American Review arrived yesterday, bearing one of my poems. Yes, you read that right--the March/April issue arrived yesterday, at the end of November. Our nation's oldest literary magazine is also currently one of its tardiest. As a subscriber (and now contributor), I wrote to them in June (when the December issue arrived, bearing an editor's note extolling Winter reading) and suggested that they might want to say something--online or in print--about the circumstances surrounding the magazine's delays. The production assistant said she would pass the suggestion along. None the less, the current issue arrived bearing an editor's note about the "droughte of March" and April's cruelty--just in time for Christmas! Still, it contains many poems I only wish I had written myself, including and especially the first place winner's poem. In fact, it is precisely because I respect North American Review that I am so mystified--not only by the delays, but by the silence. Contrast these ironic editor's notes with Ploughshares, which runs a blog to engage with topics in contemporary letters as they happen, or Zyzzyva, which also runs a blog to give a peek inside the independent periodical's "struggle day by day." I hesitate to characterize this as simply an old-media-versus-new-media divide. But actively engaging in dialog with the literary community through blog entries and comments puts a voice (or voices) to the publication that makes me feel more loyal, and somehow connected, to their project. I am not suggesting that the North American Review start a blog. The magazine was, in fact, worth the wait. And as I said in my note to the magazine staff, I wish them all the best in their efforts to catch up. But the literary conversation seems to be happening at a faster pace nowadays, and periodicals are being published for more than just libraries. I wonder if even reputable magazines can long afford to keep their workings largely offline and opaque. Categories: Poetry and Publications. Tags: Blogging, North American Review, Ploughshares, and Zyzzyva.